The vice chancellor and minister of economic affairs, Dr. Reinhold Mitterlehner, awarded AUTONOM TALENT® the Austrian State Award 2016 in Business and IT Consulting on the 17th of November 2016 in the prestigious location of the Vienna Hofburg. 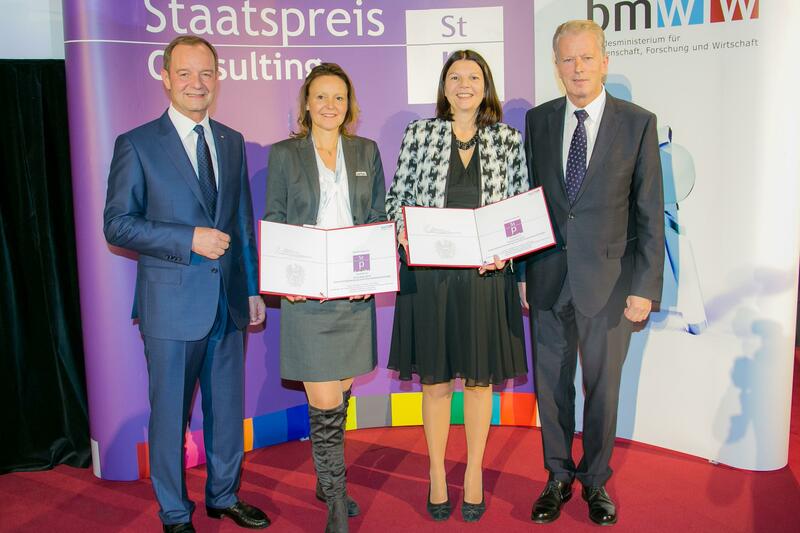 The Managing Director of AUTONOM TALENT®, Andrea Ristl, and the Managing Director of Caritas Oberösterreich, Andrea Anderlik, proudly accepted the document of the nomination for this distinguished award. Many congratulations to both ! 267 projects applied. Only 6 projects got nominated for this award, which honors the best performance in Business and IT Consulting in Austria. For our project “More easiness and fun in the health care” we got already the “Constantinus Award” from the Austrian Chamber of Commerce in summer 2016. The next step was, that we proudly got awarded with the “International Constantinus Award” in Toronto in autumn 2016 for the project “Sustaining your productivity” with our client Mondi. And now we finally got the above mentioned “Austrian State Award”. All these recently granted awards are the proof of our success in the AUTONOM TALENT® 3-step methodology: measure potential – develop talents – secure performance.